To facilitate helping you, YOU MUST INCLUDE WHERE YOU LIVE AND WHETHER YOU ARE LOOKING FOR A MALE OR FEMALE in your correspondence to us. We do not "adopt" out dogs. Adoption is for human children. We "sell" puppies. We know many breeders like to use that term as they think of their dogs as their children. Dogs are not ever to be confused with children. They are wonderful, loving, companions who make our lives enriched, but they are not "adopted." Your purchase a puppy from us and in doing so it is your puppy. You can name it anything you like. You can compete with it or not. You can have full registration with it unless we decide it is of the quality that should not be bred, in which case, you will be told that ahead of time, it will be reflected in the price you pay, and we both agree to the terms. This is a rarity. 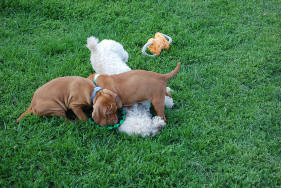 Otherwise, all our dogs are of high quality and we sell our puppies on full registration. 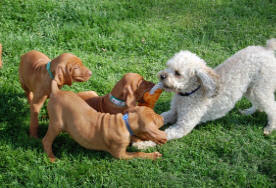 - You must contact us via phone or e-mail to inquire about availability of vizsla pups. We will no longer ship a pup via air. Normally it cost $400 for us to ship a pup, so the cost of doing this will remain pretty much the same if you come here via air. You will have 7 weeks prior to find a good price for a flight. - We also get first pick as a stud fee when any of our three stud dogs are used, so we can offer first pick male or female to someone from those litters as well. You get to do the picking, not us. Those listed below have bred to one of our stud dogs and have pups available. - Craig and Jody Cartwright in Montello, Wisconsin, had a litter 2/7/19 sired by our Man O War. Their female Ellie has our bloodlines on both sides of her pedigree. 5 males and 5 females in the litter and pups go home March 30th. Contact crajod@gmail.com or 920-295-0182. - Shelly and Eric Kliefoth in Beloit, Wisconsin, had a litter 3/14/19 sired by our Man O War. Their female Mojo also has some of our bloodlines and had 5 males and 2 females. Females are sold already. Pups should be going home end of April. skliefoth@yahoo.com or call 608-359-9640. - Rick Mitchell in Plano, Illinois, will be have a couple litters soon also sired by our Man O War and another by Tater who is the son of our 6xBISS Silver Grand Ch. Just Spike, JH. Tater is one of only 5 vizlsas in the world to have the title SAR-W. He is a Search and Rescue dog who achieved his SAR title well before age 2 which is incredibly young. mitchellvizslas@gmail.com or call 630-209-1521. If you want to read testimonials from others all over the country who have gotten their dog(s) from us, go to www.gundogbreeders.com and click on Vizsla when it comes up on the right-hand side of the page. Our name should be at the top of the list. Click on our listing and then page to the bottom to read many testimonials from all over. I think it will give you an idea why people like to get a puppy from us. We are a little behind in having people post to that site, but I think you will get a good idea of how we are as breeders. E-mail or call for details. LBUSCH@AEROINC.NET or (815) 335-7673. Scroll down for more pictures of other cute pups! Lassie's 13 pups from 2008 loved their new dog dishes. This was all ONE litter. E-mail us at lbusch@aeroinc.net. (That's a L at the beginning) Make sure you put "vizsla" or "dog" or "puppy" or something related in the subject line. Otherwise my computer may recognize it as spam.Or call 815-335-7673.